You can find a ton of beach glass at Grand Manan. You will find lots of beach glass behind the little motel in Grand Manan. The motel is practically on the ocean and is across from the Shorecrest Lodge. David (editor) adds: Grand Manan Island (also simply Grand Manan) is a Canadian island, and the largest in the Bay of Fundy. It is also the primary island in the Grand Manan Archipelago, sitting at the boundary between the Bay of Fundy and the Gulf of Maine on the Atlantic coast. 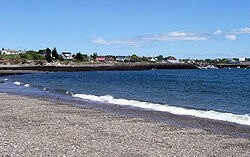 Grand Manan is jurisdictionally part of Charlotte County in the province of New Brunswick. As of 2006, the island had a population of 2,460. I've actually pick sea glass behind that motel in Grand Manan..Love your Island of Grand Manan. Note that Westfield near Brundage is totally enclosed by land and does not have sufficient wave action to significantly tumble a glass shard. Found 5-10 pieces per hour, mostly rounded edges, brown, white, green. Approximately 1 mile down from the ferry at Brundage Point, cross over railway tracks to a small stretch of beach. Also the motel is a good place to stay on the Island if you just want a basic place to stay for a reasonable rate. They also have a restaurant beside the motel and the food is good with a reasonable price too.